Before applying, read carefully this page and the Mobility Manual. 2) Click here to apply for the grants! 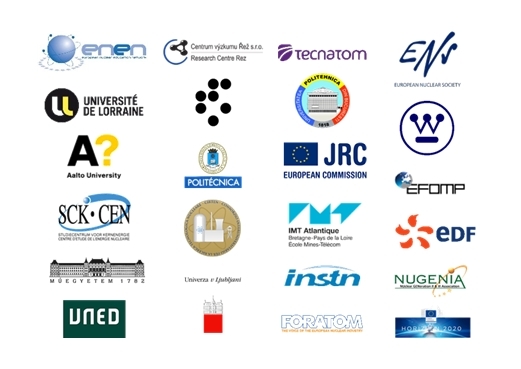 ENEN (the European Nuclear Education Network) Association, through the ENEN+ project co-funded by the EURATOM research and training Work Programme 2016 – 2017 – 1 (#755576) of the European Commission (H2020), provides mobility grants for learners, who would like to improve their knowledge, skills and competitiveness for career opportunities in the nuclear fields. BSc. students interested in pursuing a master education and/or a career in the nuclear fields. MSc. students in nuclear interested in extracurricular experience and/or academic exchange such as EMSNE. PhD. students and Post-docs in nuclear interested in academic and research exchange, access to research infrastructures and cooperation with EURATOM research projects. Professionals, interested in changing their careers to nuclear and/or building up their life-long learning on nuclear topics. Citizens of countries, which are not members of EU, pursuing studies in an EU member country and having an already established relation with the receiving institution. To the successful applicants, the ENEN+ will provide mobility grants, which are intended exclusively to cover mobility costs and access fees and will be provided as lump sums directly to the selected applicants. By submitting the application, the applicants confirm that all arrangements for the mobility actions, including, but not limited to insurance, access to the facilities, salary and material costs, intellectual property, have been agreed and resolved between the sending and hosting institutions. The call is open continuously for applications at the ENEN website (http://plus.enen.eu) between March 1st, 2018 and September 30th, 2020 or until funds are available. Please read the mobility manual appended to this call and submit the online application through the web-based system. The required documents include a CV, academic transcript or student status certificate (B.Sc., M.Sc. and Ph.D.), motivation letter and recommendation letter from the sending and receiving mentors. Further details on the application, mobility actions, grants, eligibility and priorities for selection are detailed in the mobility manual. The applicant will receive by email a delivery receipt of the application within 48 h. Applications will be evaluated and prioritized by the ENEN+ Mobility Committees. The final decision will be made by the ENEN+ Management Committee and the applicants will be informed within 60 days after submitting. Each applicant may only submit one application within one application deadline. Quality of the proposed work, training benefits, motivation and impact of the mobility action on the nuclear career of the applicant (written support by the supervisor is needed here!). Proposed time line and feasibility of the work plan and the requested duration of the mobility action. Mobility actions involving and/or organized by renowned institutions with recognized quality, such as members of ENEN, NUGENIA, EFOMP and mobility actions envisioning contributions to the running EURATOM (H2020) projects within the fields of this call. Applications requesting lower grants than the maximum amounts set out for specific calls activities below and summarized in Table 1. Order of arrival of the applications (first come first serve). Specific thematic priorities might be proposed by the Mobility Committees at different times during the project. These may include specific courses, summer schools, student competitions in international conferences, the EMSNE certification by ENEN or similar, etc. The thematic priorities might be published at specific web sites or as an update of the ENEN+ call. Successful applicants will have to submit a mission report to ENEN no later than 30 days after completion of the mobility action. Mobility grants are intended to cover mobility costs and access fees and will be provided as lump sums directly to the applicants (students, Post-docs, professionals). Mobility grants cannot be used to cover other expenses such as salary, insurance, equipment, etc. All publications resulting from the mobility actions shall acknowledge the ENEN+ mobility grant (This work has been partially supported by the ENEN+ project that has received funding from the EURATOM research and training Work Programme 2016 – 2017 – 1 #755576). Further details are available in the Mobility Manual and in the electronic application forms. Copyright © 2018 ENEN+ project, funded by the EURATOM Research and Training programme H2020 under grant agreement N° 755576.